I have been baking quite few cookies the last few weeks. One Sugar Fondant Cookies for a friend babyshower, some shortbread cookies for my daughter 1st year birthday celebration and this cookies for my Church Christmas For kids events. As mention before , my church has a C4K event yearly to bring joys and Christmas blessings to the community we are in . I did not participate in the baking last year , as I was in the confinement period ( when you being confine for giving birth reason , one shall not do anything except eat, sleep and nursing the baby). Finally this year I can spare some time to bake for this event again , I would not want to miss it , after all is more joy and blessed to give during this season then just to receive. 1. Bring unsalted butter to room temperature, cut the butter into small cube. Mix in the sugar and used electric handheld blender , blend till the butter is plain and fluffy. 2. Put in the lemon juice, sift in all the flour - cake flour, corn flour , baking soda into the butter mixture. Use a spatula to combine it well. 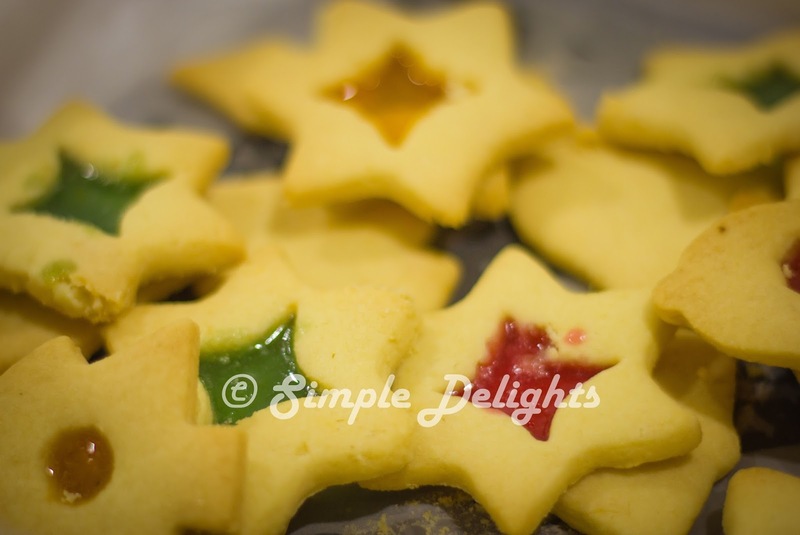 Mix the biscuit dough lightly with hand and make sure all the ingredient combine well . 3. Place the biscuit dough in the fridge for at least 1 hour. 4. Bring the firm dough out on your flour working bench . Roll out the dough to 0.5mm thickness. Used cookies cutter to cut out different shape and place it on the tray with non stick baking paper. 5. 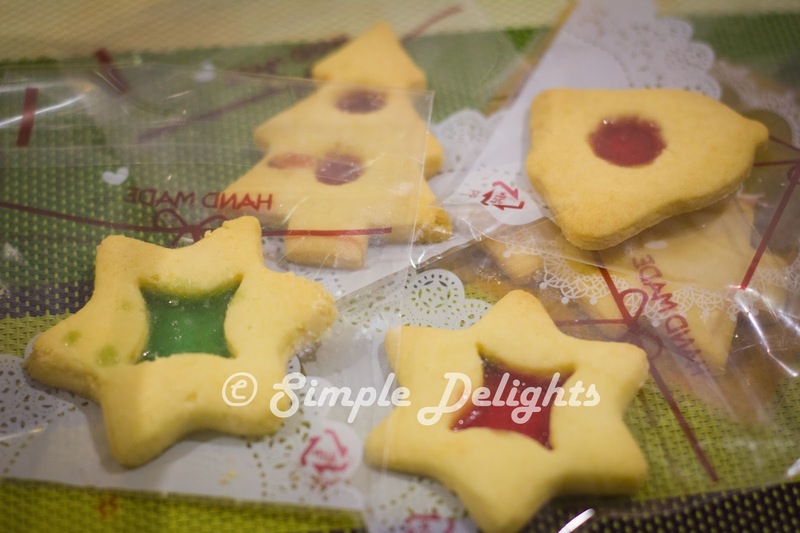 Used a smaller cookies cutter , make a hole print in the cookies when the cookies has place on the tray . To avoid breaking the whole cookies while transferring the cookies. 6. Preheat oven to 165C , bake the cookies for 10-13min. While the cookies in the oven, break the crystal candy into small pieces. Place different color candy in different bowl . Only do this step when cookies start baking , to avoid the candy melting and stick together. 7.Bring the baked cookies out from the oven without turning the oven off. Place the candy into the print hole we have make. Carefully not to put too much candy as will cause it overflow into the cookies surface area. 8. Place the cookies back to the oven and bake another 3-5 min. Till the candy melt in the print and the cookies can be taken out from the oven . Let it cool on the rack . Once cool down the candy will be harden again and is good to take out . Is such a pain to bake cookies during summer, the dough turn soft and is hard to maintain the shape while placing onto the baking tray. I have to keep putting the dough in the fridge to cool down. This has slow down my baking process. I am rushing to have all cookies finished baking while my little one is asleep . Well, I fail to do so , I then literary has a "koala' hanging on my leg while I am cutting , rolling the dough . What a challenge ! As I promise to contribute 24 cookies for the events, I persist to make extra, just in case , some did not turn out well . Thank GOD , I have some good shape looking one and some just got to leave for my beloved as his snack. 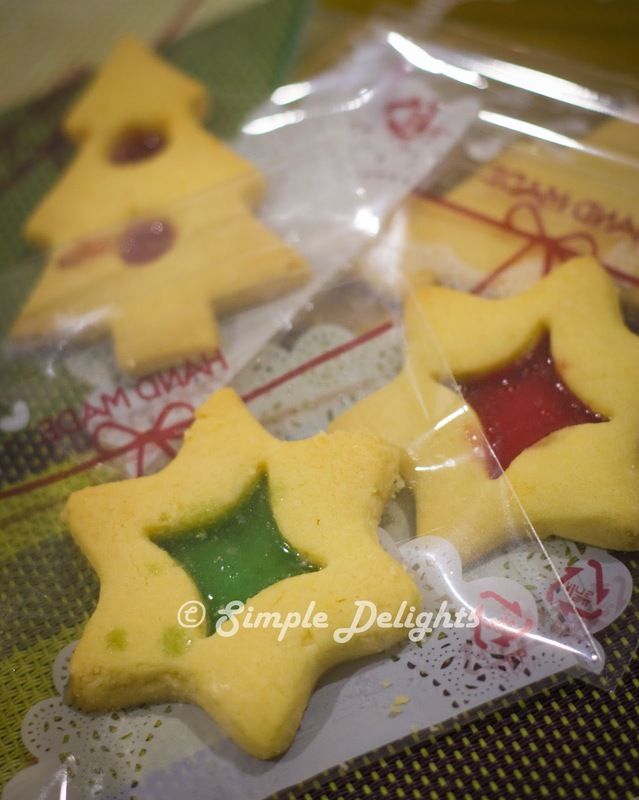 So here is my Christmas cookies and hope you will give it a try . 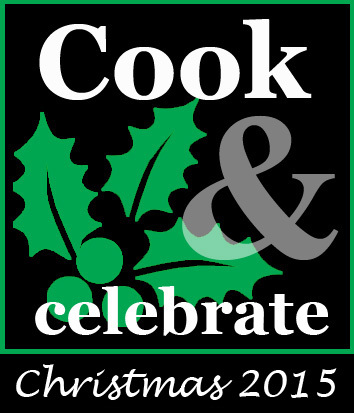 I am also submitting this post to -> Cook and Celebrate: Christmas 2015 event. organised by Yen from GoodyFoodies, Diana from The Domestic Goddess Wannabe and Zoe from Bake for Happy Kids at here. Nice to have you baking with us at C&C! Your Christmas stained glass cookies look so lovely and festive!